Later topic: Brower ball-bearing proof press-help please! I have crushed type be for but this seems strange. 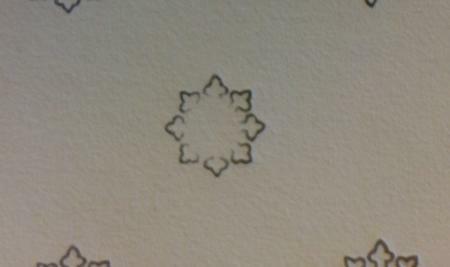 I’m printing small snow flakes. They seem to be getting crushed on the inside. I can’t figure out what is happening. This is what happens to large Monotype castings. If you cut this open you would see a large bubble in the casting causing the center of the ornament to collapse. Will this happen to all of them or just some ? Looks like you are socking them pretty hard — I would say if they were all cast in a batch, yes, it will probably happen to all of them. Perhaps just One clear shot on B. P. for the type identification specialists to establish the source & origins of the Foundry/Typecaster, before the Jury returns from the Jury room.??? Piece in question, might even prove to be, NOT listed in Monotype (ornaments) specimen Books.??? Pressing metal type into the paper can damage the face. I would suggest photopolymer for an impression. you can use a 600 grit sand paper to lightly AND SQUARELY sand the image. it may bring it back depending on the damage. keep it level. Sanding the ornament will do nothing to fix the impression, neither will extensive makeready, because the problem is structural. If you can get a clean proof, you can always have magnesium or polymer cuts made which shouldn’t suffer with this problem.